In my undergraduate years, I have become very involved on campus. I have been on the leadership team for HackRPI, an annual intercollegiate, 500-person hackathon at RPI, since the first HackRPI in the Fall of 2014 my sophomore year. Now I am one of two co-directors for HackRPI 2016. 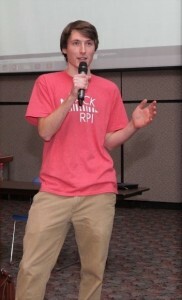 I am also the President of the Rensselaer Hackathon Organization, tasked with encouraging, organizing, and facilitating participation of RPI students at hackathons at other schools in the region. Furthermore, I am a member of Pi Mu Epsilon, the national mathematics honor society, where we work to build a stronger mathematical community at RPI. In addition, I am an active member of Upsilon Pi Epsilon, the international honor society in the computing and information disciplines that provides tutoring and educational technical talks for the campus community.